Lemon balm is an herb that is common around the kitchen and found in many gardens. It also has many medicinal properties and has been used throughout history. Lemon balm is a member of the mint family. 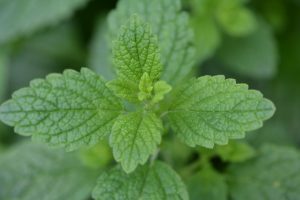 Many chefs and herbalists will use lemon balm due to its calming properties and as remedy to lift spirits and relieve tension. The lemony smell and white flowers of the lemon balm plant have led to its widespread cultivation in gardens. One has to be careful with this sun loving and hardy plant because it can easily take over a garden, however, lemon balm has been used as a mosquito repellant. Light and fresh, lemon balm adds a splash of citrus and mint undertones to sweet dishes. Use the young tops of the plant for cooking and teas because the large, older leaves tend to have a soapy, musty flavor. It is best used fresh but can be dried quickly and stored. Lemon balm can also be used as a flavoring in ice cream, fruit dishes, candies, syrups, beverages and herbal teas. Lemon balm is a native to the Mediterranean region. It’s history dates back to the Greek and Roman times with using lemon balm medicinally to treat wounds including snake bites and scorpion stings. In the Middle Ages, lemon balm was used to relieve nerve tension. Lemon balm’s popularity has remained throughout the centuries and was used as tea to combat mental confusion and as an elixir thought to extend lifespan. The lemon balm infused “miracle water” was thought to improve memory and vision. American Shakers grew lemon balm and used it to treat mild fevers. Medicinally lemon balm has many documented uses. Aroma therapists use the essential oil to relieve anxiety, shock, depression and nightmares. Due to its antispasmodic characteristics, the soothing effect it has on the stomach and digestive system, lemon balm has been used to relieve pain and discomfort associated with indigestion, gas and bloating. It has also been used to relieve menstrual cramps. When combined with German chamomile, lemon balm is an effective treatment for eczema and allergies. The sedative tea eases headaches, nervousness, anxiety and insomnia. It causes a slight dilation of the blood vessels, helping to lower blood pressure. Lemon balm has been used for diseases involving herpes or viruses. Creams and ointments that include lemon balm have helped to heal cold sores or genital sores induced by the herpes simplex virus. It appears to make herpes flare-ups less intense and last for a shorter period of time, but it does not eliminate them completely. There has been some research using lemon balm in Alzheimer’s disease to reduce agitation. But remember it is always best to check with your doctor before using any kind of supplement or medicinal plant.